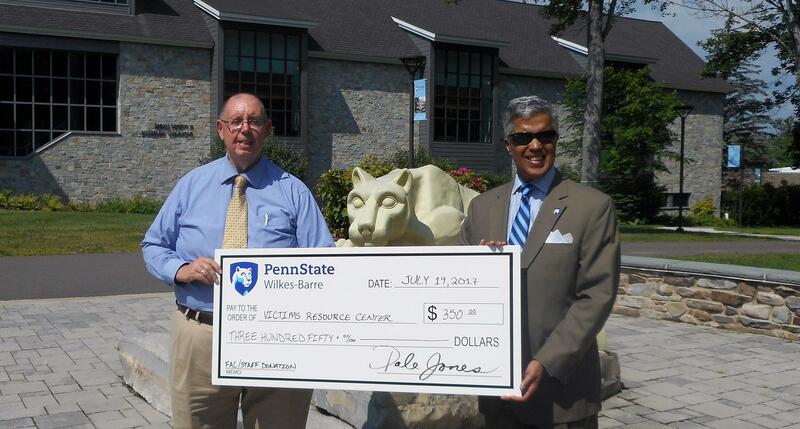 Patrick Rushton (above, left) Outreach/Education Manager for Victim’s Resource Center receives a donation from Dr. Dale Jones, Penn State Wilkes-Barre Chancellor and Chief Academic Officer. Penn State Wilkes-Barre recently presented a donation of $350 to Victim’s Resource Center of Carbon, Luzerne, and Wyoming Counties. Victims Resource Center provides a comprehensive range of services to meet the special needs of crime victims, to address issues of violence on an individual and community level and to increase the understanding of the impact of crime on victims to improve their quality of care including, but not limited to: advocacy, education programs, 24 hour hotlines, support groups, and crisis intervention. Victim’s Resource Center holds several educational outreach sessions on campus each year for students. Funds for the donation were raised through dress down Fridays held for Penn State Wilkes-Barre faculty and staff throughout the spring semester. Participants paid $2 to wear jeans and funds were voted upon for donation.